M-I-C-K-E-Y M-O-U-S-E!!! Mickey Mouse is the most loved cartoon character from past 80 years now; it is still a popular cartoon character among kids, all thanks to Walt Disney for creating the most popular mouse! Everyone just loves mickey mouse and his world. Mickey Mouse is the perfect theme for anyone who’s celebrating their birthday. Who says that Mickey Mouse birthday theme is only for kids; it is the perfect theme for 1st birthday, 5th birthday, or even 50th birthday! 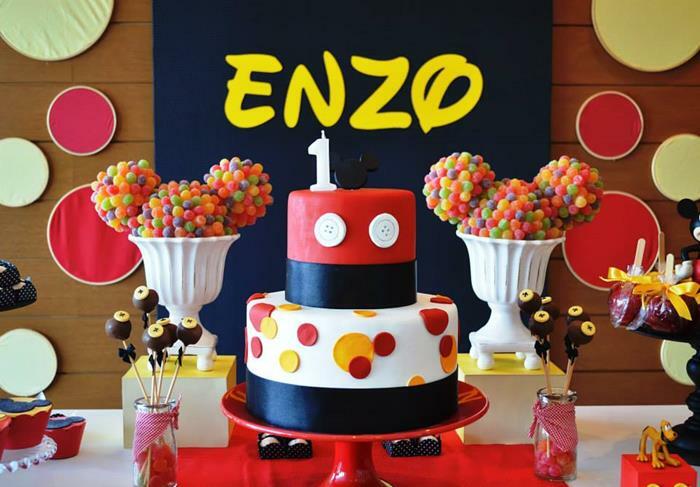 Mickey Mouse birthday party theme has been a popular theme for more than 75 years now. Nowadays Mickey Mouse club house parties are a sure hit! I mean who doesn’t loves to celebrate their birthday together with Mickey, Minnie, Daisy, Donald, Goofy, and the rest gang? If you are planning a Mickey Mouse birthday party, you have come to the right place. We have got everything under the roof starting from venue decoration to food and then to unique and creative table centrepieces, we are sure to surprise you and your guests with these easy peasy Mickey Mouse party ideas which will just wow your guest and will make your party just above all the rest, we guarantee you that we will give you and your guests Disney fever! When it comes to decoration Mickey Mouse is associated with certain specific colours like red, royal blue, yellow, white and black. These colours portray the image of Mickey Mouse and as soon as everyone will see these colours they will get those Mickey Mouse vibes. All the decorations you use at the party venue should be in these colours only. There are huge Mickey Mouse banners available in the market, if you don’t like what is available in the market you can even get your own specially designed Mickey Mouse banner for your party or DIY it if you are good with art and craft, and make sure to place this right at the entrance so that it is visible from distance, you can also use two giant Mickey Mouse plastic foil balloonsand place them at the entrance, both side each. This will look like a perfect entrance and Mickey Mouse himself will be welcoming the guests how amazing it looks like, Right? There are so many Mickey Mouse accessories available in the market like life size images of Mickey Mouse and its other characters, stickers, posters, face masks, etc. Make sure to use as many as of Mickey Mouse accessories as possible to add every inch of Mickey Mouse vibes to the venue. However be careful not to bunch up the place with too many accessories this will make the party venue look ugly. Birthday party invites is one of the first thing you do after finalizing your party. Invitation is the introduction to your party and guests will be so excited after receiving their invites for the party to attend the party, invitations not only inform the people about when and where the party is going to be, but they can also let the guests know what the theme of the party is and what they can expect from the party. Hence, it is always important to get a personalised birthday invitation cards made which would reflect the theme of the party. For the Mickey Mouse theme birthday party invites it is important to use all those mickey things for creating the invites, if you are great with DIY’s you can design your own invitation card all you need is red coloured cardstock, yellow, white and black coloured accessories and something in polka dots; if not various readymade options are available in the market or you can get them designed accordingly. And always remember that if your cards don’t portray the theme properly, then guests will never take the theme seriously and any dress code or requests made by you for the guests as per the theme will be easily ignored by them. When you go to any birthday party eyes are always on the birthday cake and seeing the Mickey Mouse in cake form has to be a wow moment at the Mickey Mouse birthday party. Red, yellow, black, and white colours make such a pleasant combination. You can also order a Mickey Mouse chocolate cake and it is sure to be a hit among your guests. This Mickey Mouse cake is perfect for any birthday party and will make a great centre piece on your sweets table. Time for some DIY now, you can prepare your own fun, budget friendly craft. All you need is hot glue gun, glue, scissors, black paper plates, and black cardstock paper. Cut perfect round circles from the cardstock paper and stick two each on the both sides of the black paper plate, like Mickey Mouse’s ear. They will look so beautiful when kept on the table and can be an eye catcher for the guests.When you are making these black Mickey Mouse party plates use red coloured table cloth beneath, to add those Mickey Mouse Vibes. These are super cute and adorable DIY Mickey Mouse cups. They are budget friendly and super-duper easy to make, guests will love your attention to every single detail and details of a party are what set it apart from the rest. These cute Mickey Mouse party cups will be like a simple décor idea that makes a big impact on your guests. Just grab those red coloured party cups, circle puncher and white paper, stick them to your red cups. Look how simple is that! Your very own Mickey Mouse Cups are ready. This is like another super easy DIY project for your party. Get your hands on those red bowls from your local store. You can download templates or draw your own Mickey Mouse hands. Cut them out on white cardstock paper along with two circles and attach them with the bowl. They will look adorable with Mickey Mouse plates and cups. Everyone will love this simple yet creative idea! When you are throwing a Mickey Mouse themed party how can you forget to include mouse-ka-tools! These mouse-ka-tools idea will be so perfect for the party that everyone will just fall in love for them. All to be done is wrap some yellow utensils with red napkins and add some mickey ears; you can download your mickey ears or you can make your own Mickey Mouse ears with the help of black cardstock paper. Now grab Mouse-Ka-Tools sign you can either get it readymade or write on your own and add this to your utensil basket. This will attract everyone’s attention and kids would love to use them while eating. These paper lanterns will steal the show at a Mickey Mouse birthday party. Supplies you will need for making them are white paper lantern, red and black acrylic paints, paint brushes or sponges, hot glue gun and glue, yellow and black foam sheet and a pair of scissors. First of all assemble the lantern and then paint the top half of the lantern with black acrylic colour and let it dry for several hours and then colour the bottom half of the lantern with red acrylic colourand then allow it to dry for several hours you can colour them using paint brushes or sponge its totally up to you. As, now your painting part is over now cut two oval buttons out of the yellow foam sheet and glue on, now cut two ears accordingly from the black foam sheet and then cut two slits in each ear and then paste it on the top of the lantern. Isn’t this décor amazing and budget friendly but it makes a big impact! You can craft a huge Mickey lantern and use it as a ceiling centrepiece coordinating with streamers hanging across the ceiling. Are you looking for the appetizers for your Mickey Mouse themed birthday party, these cute and delicious Mickey Mouse cupcakes can be your best party appetizers. Ingredients required for making them are you need one box of black and white cupcake mix, two eggs, ¾ cup water, ¼ cup oil, frosting pouch, 2 tsp. water, ½ cup butter softened, sprinkles, Oreo cookies. Start by making cupcakes as directed on the box (blend mix, 2 eggs, water and oil and pour into liners) bake them as stated on the box and let them cool down.Remember to wait to make frosting when close to serving. For frosting add ½ cup of powdered sugar and a table spoon of milk blend it well with the frosting pouch, water and softened butter. Now add frosting to a piping bag and pipe on cupcakes. Now add some sprinkles and don’t forget to add two Oreo cookies for the ears. For cupcake cups go for red and white polka dots design. Don’t they just look darling in those red and white polka dot cupcake cups? Wasn’t it easy to make appetizer. Mickey Mouse is recognised by his cute ears and is the most identifiable feature of his character, and there are hairbands available in the shape of these ears in the market. You can buy them and hand over to the attendees as soon as they arrive at the venue and request them to wear the hair band throughout the party. For more detailing you can buy pink hair bands for girls and black one for boys. Who doesn’t loves to be clicked? Set up a small photo booth at the venue with all the Mickey Mouse club house life size cut out characters, everyone will just love to be clicked as Mickey, Goofy, Minnie, Daisy, Donald and Pluto. Trust us this will be the most loved corner of your party. No party is complete without proper and fun games. And when you have an amazing theme of Mickey Mouse, it becomes really important that you plan for games which are not just as per the theme but are fun to play. There are many games that can be performed at these birthday parties like you can place a poster of Mickey Mouse on the wall with his ears or nose missing and blind fold the eyes of the contestant and blindfolded he has to pin it’s ears and nose. Make sure that games should be so much fun that nobody gets bored. Who thought creating these beautiful Mickey Mouse table centrepieces would be so easy? All you need is Styrofoam balls of two different sizes two small balls and the other one slightly larger. Wrap them in black yarn. The smaller are the ears and are attached to the slightly larger “head” using toothpicks. Now push a straw into the base of the head. Your Mickey Mouse centrepiece is ready now you can display it in a vessel. Food is the heart and soul of any party, food that is served in the party depicts the theme of the party so in the Mickey Mouse themed birthday party it is not only important that food should be tasty but try to make sure that the presentation of these food items is in the shape and colour of Mickey Mouse. You can go creative with your food items. Any party that is based on the theme is incomplete without a dress code; make sure that everyone dresses up like the characters of Mickey Mouse if not possible you can request them to follow the colour code which is associated with theme. This will set the atmosphere for a Mickey Mouse party. Hopefully, these ideas will help you to plan a great Mickey Mouse birthday party.